The second volume in this new series of updates contains chapters on the chemistry of amino-, nitroso-, and nitro- compounds, supported by chapters from the 1969 volume and the 1982 Supplement F. This survey comprises an up-to-date review of research in nitrones, nitronates, and nitroxides. 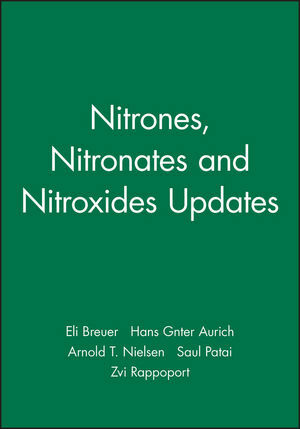 Eli Breuer and Hans Günter Aurich are the authors of Nitrones, Nitronates and Nitroxides Updates, published by Wiley. Nitronic Acids and Esters (A. Nielsen). Nitrones and Nitronic Acid Derivatives: Their Structure and Their Roles in Synthesis (E. Breuer). Nitrones and Nitronic Acid Derivatives: An Update (E. Breuer). Appendix to °Nitroxides° (H. Aurich).